I've just finished a handout that you can all have for free. It's called The Top Ten Secrets of Great Flute Playing. 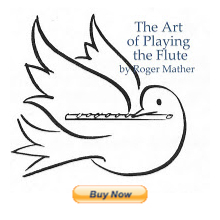 It has cartoons, funny stuff, some great advice on the basics, and would be a boon to any flutist or band teacher who needs "those extra booster secrets" that we're all dying to know. The cheap to print Black and White version is here. The amazingly colourful version for the luxury of colours on your music stand is here. I'd love it if all the flute teachers who grab this document would help send it around. Please *do* email it to all your flute students, and band directors? Please DO photocopy it and hand it out in September.